This original painting is currently available for purchase. For more information, please contact here. 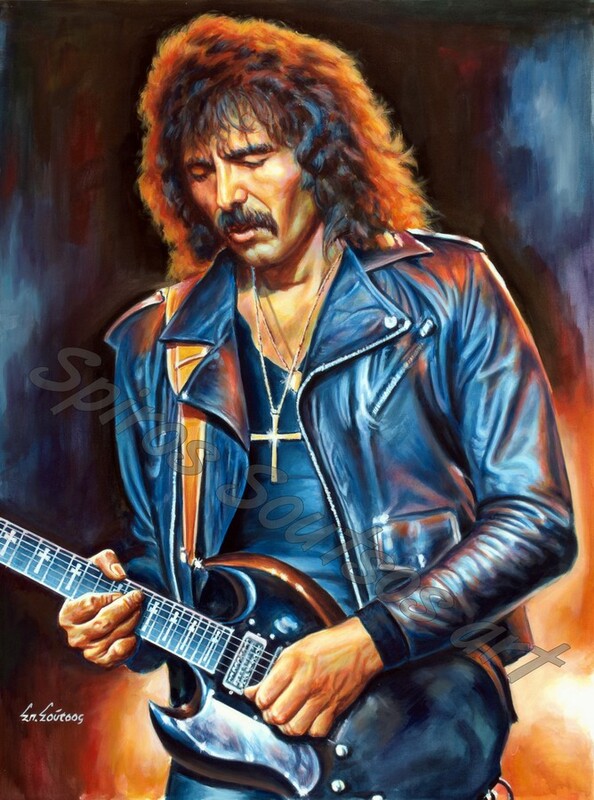 Anthony Frank “Tony” Iommi was born in Birmingham, Egland on 19 February 1948 . He is the lead guitarist and founding member of the pioneering heavy metal band Black Sabbath, and he has been the band’s sole continual member and primary composer. Iommi is widely considered one of the most influential rock guitarists of all time. A prolific riff writer, he was ranked number 25 in Rolling Stone magazine’s list of the “100 Greatest Guitarists of All Time”. While working in a factory as a teenager, left-handed Iommi lost the tips of the middle and ring finger of his right, fretting, hand in an accident; an event which crucially affected his playing style. Iommi briefly left Black Sabbath’s forerunner, ‘Earth’, in 1968 to join Jethro Tull . In 1969, he returned to ‘Earth’ renaming the group name to ‘Black Sabbath’ and recording their self-titled debut album. By 1970 Iommi had detuned his guitar from E to E♭ (a minor second down), and from 1971’s Master of Reality album, had detuned it further to D♭ (a minor third down), to ease the tension on his fingers. Bassist Geezer Butler did the same to match Iommi play. Sabbath were among the first bands to detune, and the technique became a mainstay of heavy metal music. Iommi combined blues-like guitar solos and dark, minor-key riffing with a revolutionary high-gain, heavily distorted tone with his use of a modified treble-boosting effect-pedal and a Gibson SG. In 2000, he released his first solo album Iommi, followed by 2005’s Fused, which featured his former bandmate Glenn Hughes. After releasing Fused, he joined Heaven & Hell, which disbanded after Ronnie James Dio’s death in 2010.